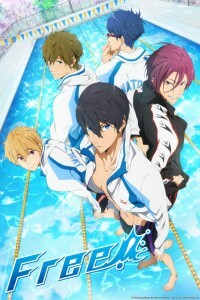 There’s been so much buzz about Free!, from the first announcement to the first episode, that it’s almost impossible to really know what to expect going into the show. Well, other than the fact there would be guys swimming, and even then we really had no idea how often they’d be doing that. I mean, look at how long it took the K-ON girls to get to play an actual gig. I’ll also say it straight out: no one was as excited for this show as I was. As a long time competitive swimmer and a long time sports series addict, the lack of a series about swimming (even if Golden Boys’ swimming scene is classic) was a huge hole to me that needed to be filled. So the announcement came, the excitement rose, and so did the worries that as much as I trusted Kyoani to deliver on gorgeous animation, I wasn’t sure how they’d deal with the story. Fandom buzz didn’t help, between Crunchyroll’s atrocious petition and the general atmosphere that the only good thing about this show would be half-naked men everywhere – not quite the right answer to the “but there are too many moeblob shows out there!” argument. Thankfully, Kyoani delivers on more than just gorgeous animation. They’ve got an entire team working on just water animation, and wow. I’d like to just say that my heart stopped when Rin and Haru did a flip turn at the very beginning of the episode. It’s that smooth. Then the challenge arises of what they’re going to do with the story. Swimming isn’t like most team sports, where you’ve got an easy angle of working together and friendship and a national high school championship as a goal to reach towards. Being more individualized, you’ve mostly got the relay as your focal point for bringing everyone together, and that’s just what Free! does. We’ve got the freestyler, Haruka, who can’t go a day without being in the water, the backstroker, Makoto, his long-time friend, the breastroker, Nagisa, who supplies the energy for the team, and then the flyer, Rin. The only problem is that Rin moved to Australia to study swimming (it’s news to me that these schools exist, but anything for Kyoani). Rin’s recently moved back, but is at a different high school than the other three, leaving them without a leg of their relay. DUN DUN DUN. All in all, Free! is incredibly fun. It plays itself up for laughs, between Haruka wearing his swimsuit everywhere or stripping at the first mention of a pool, Makoto’s fear of ghosts or long-suffering sigh at finding Haruka in the water instead of at school, everyone’s DRAMATIC STRIPPING, dubstep background music, and purposefully giving all the guys really girlish sounding names. That aside,it also definitely keeps itself grounded in the fact that it’s a show about swimming and swimmers who actually know what they’re doing. Overly ridiculous, sure, but in a way that makes you want to keep watching.